PSI » No smoke and mirrors please! There was a time when a smoke alarm was a relatively simple thing in terms of features; usually it was restricted to test and hush buttons or the option of a re-chargeable back-up power supply. As a result, deciding which alarms to use was an equally simple decision. But recent years have seen an avalanche of smoke alarm features and functions. Keeping up to date and sifting between the genuinely useful features and those that lean more towards a gimmick, is tricky and time consuming. 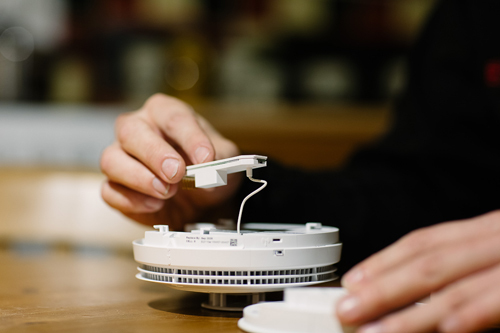 Although introduced to domestic smoke alarms well over ten years ago, wireless alarm interconnection remains one of the most valued smoke alarm features by installers. It enables alarms and system accessories to be interconnected using Radio Frequency (RF) signals rather than hard wiring. Hard wired interconnection is time consuming, disruptive and costly in existing properties, whereas wireless interconnection is quick, easy and requires no redecorating. The RF technology has traditionally been housed in the alarm bases, but the latest alarms in the market have moved this to the alarm itself as a plug in module. The small module, sold separately, simply plugs in to the alarm quickly and easily, turning it immediately into an alarm with wireless interconnection – a quick and easy solution. The importance of alarm interconnection is recognised under Building Regulations and BS 5839-6:2013 (the British Standard for domestic Smoke Alarm installation). When one alarm goes off, all the other alarms on the system activate. It provides an earlier warning for residents and the best chance of escape. Wireless alarm interconnection has led to an increase in the number of alarms or accessories in one system. With a larger number of interconnected alarms per system and, in some cases with Carbon Monoxide (CO) alarms included, it is important that a simple, convenient method of controlling all the alarms is adopted. Alarm controllers provide a cost effective method of doing this from a safe, accessible location. At the very least, the controller should allow tenants to test and silence alarms on the system and ideally also locate the trigger alarm. The latter aspect is essential if CO alarms are included in the system as a resident needs to know what action to take. One of the latest developments in alarm technology is data extraction, which is the ability to quickly and easily retrieve useful and meaningful data from the alarm. I think this has the potential to become as popular as wireless alarm interconnection has. It’s definitely the rising star of the smoke alarm world! Smoke and CO alarms have the potential to provide genuinely useful information. This could include battery life, alarm sensor status, number of times tested and any alarm activations with details of when it occurred. In the case of CO alarms, this could go further with information on detection levels of CO during any activations or background CO.
More recently, this data has extended to cover whole systems, providing access to data on, the number of devices on each system and their serial numbers, types of alarms, location of alarms and how long the alarm has been in operation. For larger systems (often in HMOs), this enables a history of alarm systems in individual dwellings to be created. Quite a few alarms in the market claim to provide the user with valuable data, but in some cases specialist (and therefore expensive) equipment is required to do this and the alarm itself may need to be removed from the property. 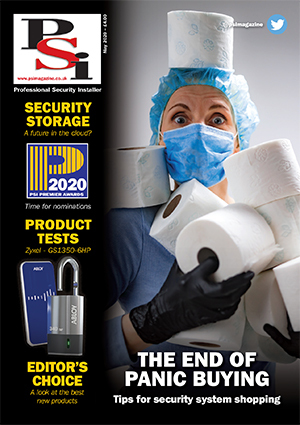 Look for alarms that enable quick and simple data extraction that can be performed on site, in real time, all without taking the alarm off the ceiling. It is now easier to connect fire/CO alarm systems to other systems; the most common being telecare/warden call systems, sprinkler systems and BS5839 Part 1 panel based fire alarm systems. The latter is particularly useful when that Part 1 panel based fire alarm system is fitted in the communal areas of Houses in Multiple Occupation (HMOs) and apartment blocks. In this instance the individual apartments would be fitted with a BS5839 Part 6 domestic smoke alarm system; if this is triggered it will only sound within that individual flat. To maximise safety and ensure the communal alarm can be heard within each property, it is beneficial to integrate the two alarm systems so that the Part 1 communal system will activate all alarms throughout the entire building if a fire is detected, but does not allow individual flats’ alarms to activate those in the communal areas or those within other tenant’s homes. Relays are one option for achieving this, but there are products in the market that have been designed specifically for this purpose which are better equipped to integrate these systems. Smoke alarm features are changing at a relatively fast pace, but just because it’s new doesn’t always mean it’s needed. These are my key recommendations for smoke alarm features to look out for in the coming year but, ultimately, if there’s one key piece of advice I can give, it’s go for a good quality alarm over bells and whistles.